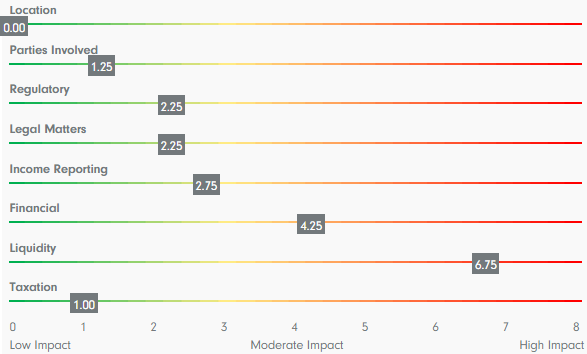 In production since 2013 and launched mid-2014, our impact scores are designed to highlight at a glance the relative impacts we feel each aspect may have upon the investment and therefore merit greater scrutiny in your internal due diligence. Each investment we review is scored and the scores are viewable on the website and at the rear of the review itself. The impact scores have been designed to rely only on factual aspects of each investment and our own algorithm, eliminating as much subjectivity as possible. Each of the aspects is scored across up to six different criteria, the scoring represented by a numerical value from 0 to 4. The criteria used are in line with the outline for each aspect given above. For example, one of the criteria for Parties Involved is adverse press comments. Weightings have been applied to each of the criteria within an aspect as we consider that different criteria may have more or less significance on the impact of that aspect. The weightings range from 0.25 to 1.5 and multiply the score applied to arrive at an adjusted score. Some criteria have been given a low weighting, for example the length of time the investment has been established, as in isolation we do not believe it is likely to have that great an impact on the investment. Other criteria, such as certainty of title, have the maximum weighting as we believe that this could have a very significant impact on the investment. Each Aspect is scored out of 8 so that the potential impact of the aspect can be compared against other aspects.